While fighting your way through the streaming mass of tourists waiting to board the Ellis Island ferry you may have noticed the following line -- by poet and grizzled New Yorker, the late Frank O'Hara -- splashed prominently across the fencing: "One need never leave the confines of New York to get all the greenery one wishes -- I can’t even enjoy a blade of grass unless I know there’s a subway handy, or a record store or some other sign that people do not totally regret life." As it turns out, the placement of poetry in Battery Park wasn't a random act of poetic vandalism. The Poets House, a SOHO institution since 1985, is celebrating the grand opening of its new location -- in Battery Park of all places -- this weekend. Inspired by the words of Stanley Kunitz, a founder of Poets House, who said, “I dream of an art so transparent that you can look through it and see the world,” the exteriour is almost entirely glass. 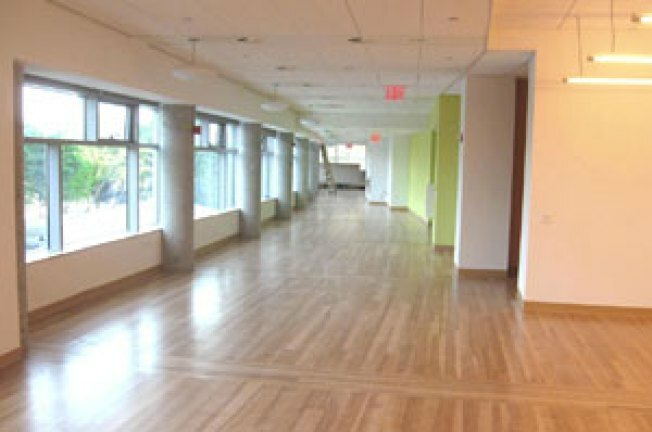 In the spirit of the times, it is also LEED certified and the floor of the public programs room is from a sustainable beechwood farm in Pennsylvania. "There has been an upswing in the appetite for poetry," Kate D. Levin, the city's cultural affairs commissioner told The Times. With a rent free lease until 2069, poetry doesn't have to pay for you to now have a place to enjoy it. Either way, The Lower Manhattan Development Corporation has her back: "It's part of an effort to make Lower Manhattan an arts community," says the organization's president. Hopefully, this effort will include a ban on foam Statue of Liberty hats. The open house begins at 12 noon followed by a reading at 3 p.m. by pulitzer-prize-winning poet Phillip Levine, Poet Laureate Billy Collins, Mark Doty, who all recently read at The New School, and others and music by Natalie Merchant. The public library and reading rooms will be open September 29.